Free form pies are interesting and easy to make. 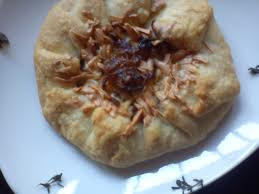 They are also known as galettes and crostatas, a rustic kind of tart. You don't need a pie dish to make a free form tart, so none of the precision that is associated with rolling out a pie crust is necessary; no need to fiddle with the edges, no need to roll out the pastry larger than the pie dish, no need to patch the inevitable holes and cracks, no need to bake blind! 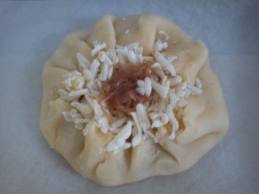 Just roll out the pastry into a circle, spread your chosen filling over it, fold the edges and bake it. Why onion as a filling? Well, as with their prettier tart pan cousins, the free form is good with both a sweet and a savoury filling. And what is the cheapest vegetable in the market today? Yes, onions. And don't think that I'm kidding you- after the onions have done their time in the pan, you won't believe the flavour this humble vegetable holds in its many layers. When baked, the onion has an extremely savoury flavour, and a hint of sweetness that is intrinsic to the onion. On the flip side, I've used a rich shortcrust, also known as pâte brisée. But then, what's a tart without a rich, tender crumb? This recipe makes one 8" tart. Heat oil in a frying pan, add in the butter and when it melts, toss in the sliced onions. Saute for about 15 minutes, and when the onions turn glassy, sprinkle over the salt and pepper, reduce heat and then cook for about 45 minutes, stirring every now and then. Towards the end of this time, the onions should have reduced in bulk, and have turned a very pale brown. Add in the balsamic vinegar and Worcestershire sauce and continue cooking till the liquids have been absorbed. Cool the onion before filling the tart. To make the pastry, sift flour into a mixing bowl, stir in the salt and the butter. Rub in with fingertips till it is like breadcrumbs. If there are some larger bits of butter, it's fine because it helps keep the pastry more tender. Sprinkle a little water at a time till you can form the crumbs together into a ball. Cover with cling wrap and chill for about half an hour. By this time, your onion filling should be at room temperature. Take the pastry out of the fridge, dust your worktop with a little flour and roll the pastry into something that looks like a 9½" circle. Sprinkle most of the cheese to within one and half inches from the edges of the pastry, keep aside 1 tbsp of the onion and spoon the remaining over. Fold the edges of the pastry over, leaving a gap in the centre. It should look like a half open drawstring bag! Sprinkle the remaining cheese on the top and place the remaining onion in the middle. Carefully place the tart on a sheet of grease proof paper and place the paper with the tart on a baking sheet. Bake in a preheated 200°C oven for about 10 minutes, then reduce the temperature to 190°C for about 25 minutes or till the crust bakes to a light golden colour. Slice in wedges and serve hot.